Keithley 2636 : Waveform Synthesizers - Test Equipment Connection - Prüfgeräte zu verkaufen - verpachten - vermieten. ﻿The single-channel Model 2635 and dual-channel Model 2636 are the newest members of Keithley's Series 2600 family of multi-channel I-V test solutions. With 1fA measurement resolution, the Models 2635 and 2636 are optimized for applications that require low current sourcing and measurement capabilities and are the ideal choice for your next semiconductor parametric analysis and test system. 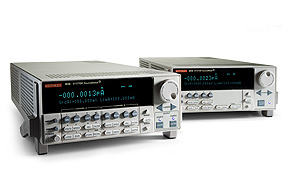 Like the rest of the Series 2600 family, each half-rack, 2U instrument combines a precision power supply, a true current source, 5½-digit multimeter, a voltage or current pulse generator with measurement, a low frequency arbitrary waveform generator, an electronic load, and a trigger controller. Series 2600 System SourceMeter instruments offer electronic component and semiconductor device manufacturers a scalable, high throughput, highly cost-effective solution for precision DC, pulse, and low frequency AC source-measure testing. Series 2600 instruments provide from two to four times the test speed of competitive solutions in I-V functional test applications. They also offer higher source-measure channel density and a significantly lower cost of ownership than competing products. The analog-to-digital converters provide simultaneous I and V measurements in less than 100 s (10,000 rdgs/s) and source-measure sweep speeds of less than 200 s per point (5,500 points/s). This high speed source-measure capability, plus advanced automation features and time-saving software tools, make Series 2600 SourceMeter instruments an ideal solution for I-V testing of a wide range of devices.